We spent a few days in Patong exploring, then a couple of weeks in Kamala Beach doing some house sitting for a couple. They are in Phuket province in the SW corner of Thailand. 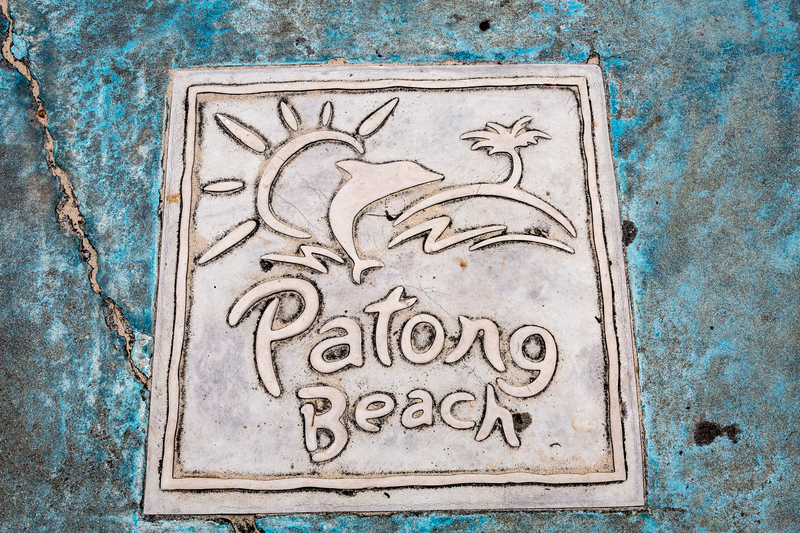 Patong Beach is the second busiest tourist spot in this locale, surpassed only by Phuket, the capital of the province. Our days in Patong were great. Once you resign yourself to the fact that everyone wants to sell you some type of goods or service, and that no one cares or is offended when you politely say “no thank you” 50 – 60 times an hour, it is quite a neat place to check out. This food market just around the corner from our hotel was fantastic. 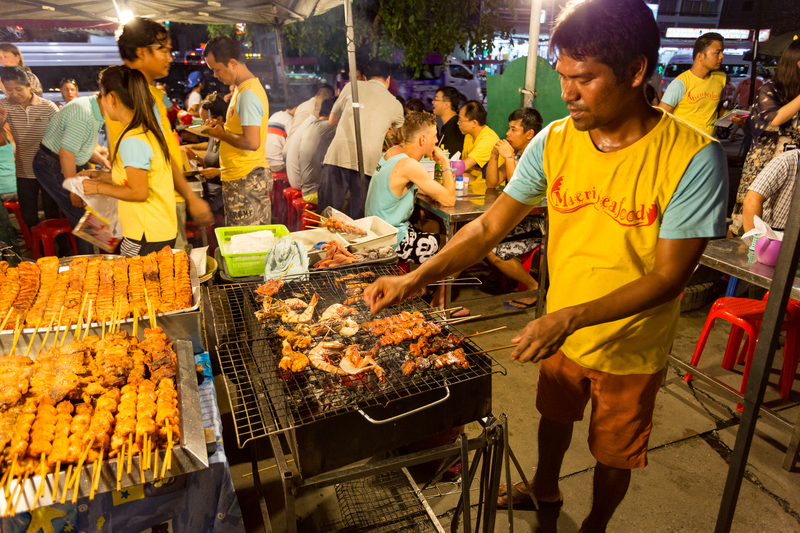 Every evening it would transform from a parking lot to a bustling food market. The seafood was incredible. Best lobster I have ever had. 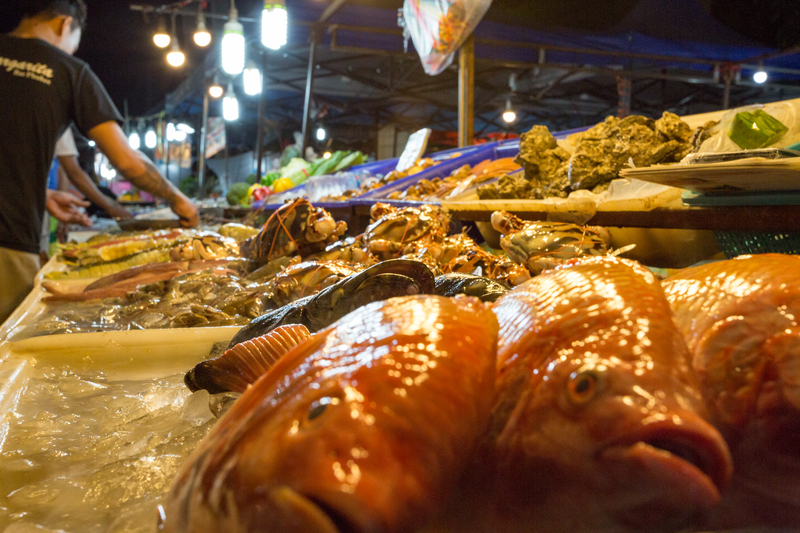 You could get fresh fish to fruit ice cream as well as many choices in between. The ice cream was made with cream and fresh fruit chopped and mixed on a frozen tray. Very interesting technique I thought. 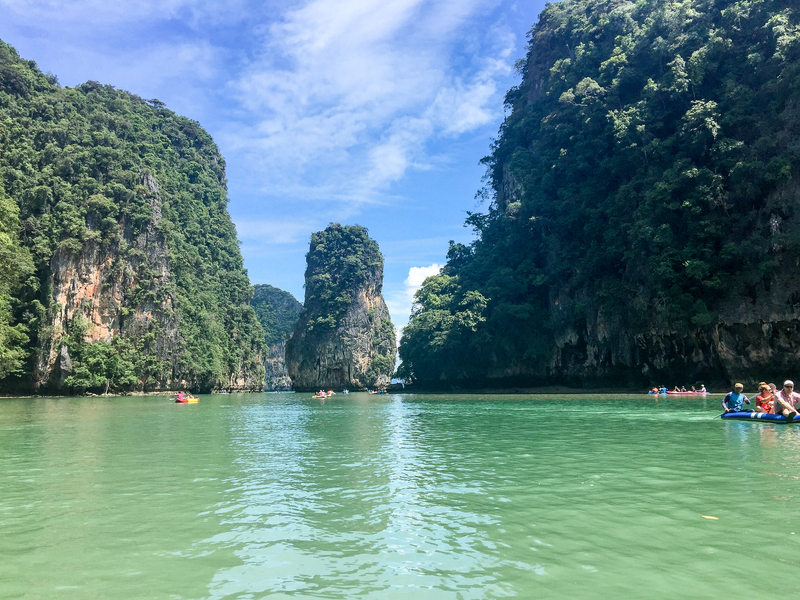 We also did an organized tour of Phang Nga Bay, the location of James Bond Island. The two hour drive was long, but well worth it. The tour consisted of a boat ride with lunch, kayaking with a guide and swimming. 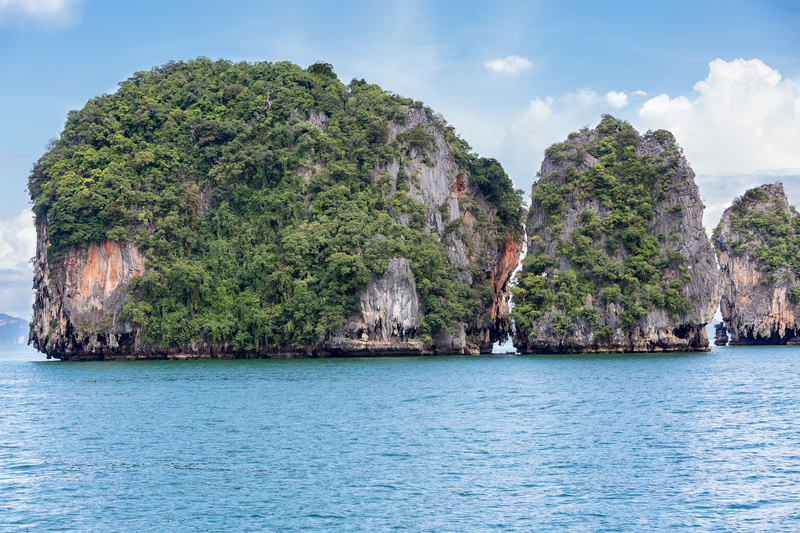 As well as a stop at James Bond Island. 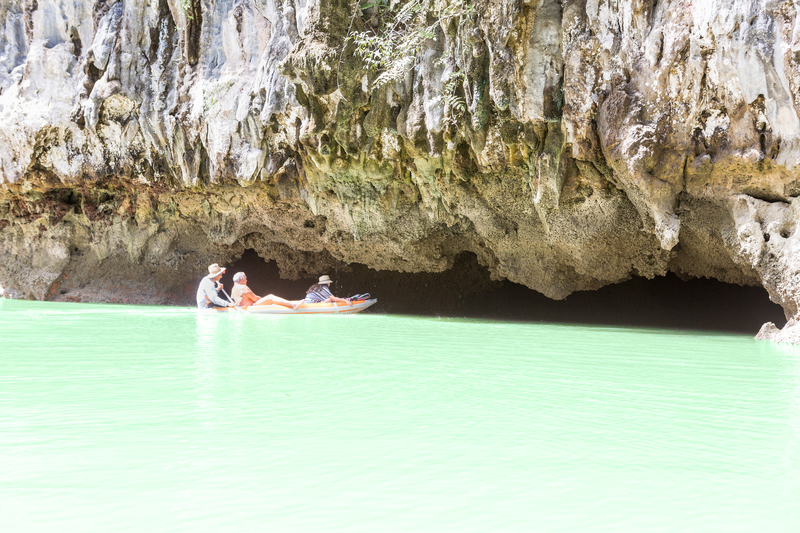 This boat was just heading into one of the caves. We had to lay down in the boats to fit in the entrances. 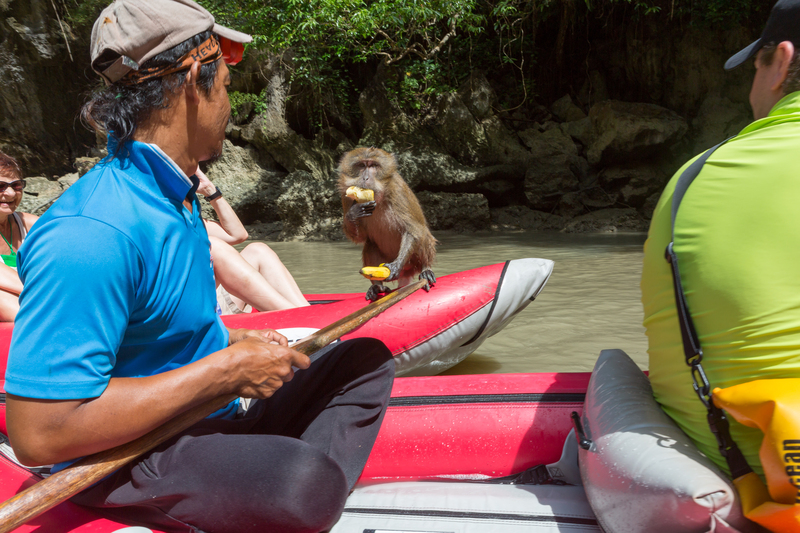 The monkeys wait patiently at the points where the kayaks have to come near the shore so they can easily jump aboard for the food they have learned is there. This monkey has chosen his boat well. They know where the food is. The tours are quite a production here and very well orchestrated. This was our tour boat. All the kayaks and guides were on the lower deck and the tourists and food were on the upper deck. A great way to see the islands. The lunchtime spread was simple but delicious. The shapes and colours of these islands is truly something to behold. Even though there are a lot of tours running through the area, there seems to be some effort to control the impact, which was nice to see. Posing for our guide as we floated amongst the islands. Beautiful. We were very fortunate to be able to spend a couple of days with the owners of the house we were going to be taking care of in Kamala Beach before they departed on their trip. They were kind enough to take us touring the area for a day which was great. We drove out to the Buddha Cave Temple (Wat Suwannakuha), also referred to as the Monkey Temple. There are hundreds of monkeys there that know they will be well fed by the locals and tourists alike. They are absolutely unafraid of humans (not such a good thing) but we had no problems with them. Some of the hundreds of monkeys that make their home around the Monkey Temple. These monkeys were disturbing at first due to the shear numbers. But once you relaxed they were fine. Made it very easy to get photos. The temple itself is located inside a fair sized cave. For a nominal donation you are free to wander around the cave. There is a bit of information available, but not much. The reclining Buddha in the cave is pretty impressive. The reclinling Buddha in the main chamber of the cave is quite impressive. There is also a section where all the Kings of Thailand have visited and carved their personal symbol into the wall of the cave. A neat bit of history. When we exited the cave we went for a walk around the area. Once you get away from the parking area the interactions of the monkeys amongst themselves was very interesting to observe. They really are amazing animals. Our hosts also took us to the Phang Nga Wildlife Nursery Station. This is a government run refuge for animals that cannot survive in the wild. I believe the intent is good, however it is obviously seriously underfunded and thus the animals appear somewhat distressed. All the enclosures are either chain link or concrete pits. We wrapped up the day on a much happier note when we stopped in at the Buddhist temple, Wat Kaew Manee Si Mahathat. This massive statue is of Buddhist monk, Por Than Klai. You cannot miss it as you drive along the highway. We stopped so our hosts could pay their respects and say a pray. The temple itself is quite similar to the hundreds of others in the country. It is beautifully cared for and colourful. Truly the statue sets it apart though. During our two week house sitting in Kamala Beach we spent several days enjoying the sun and surf down on the beach. It has been a wonderful time here in Thailand and we look forward to returning sometime in 2017. Wow! so enjoying following along your travels. Great pictures and lots of good info. Thanks! We are heading to Thailand in February. A golf trip for me with some ex City people and touring for Yvonne and I when I’m not golfing. Your posts for Thailand are a great resource. Thanks for doing these. Keep travelling safe.